Some of you imagine me as a knight in shining personal-finance armor, riding around on a white horse with golden hooves, correcting financial injustice and pointing out hypocrisy and inaccuracy in an unfair world. But sometimes I deign to do normal activities, like a couple weekends ago. I’ve written about my love of Taco Bell, pens, and ironing on this site. But on Super Bowl Sunday, I went on a buffalo wing crawl, proving once and for all that (1) I hate sports and (2) I will out-eat anyone in a spicy-food eating contest. Also, I may not have that much class. Have you ever heard of a pub crawl? It was like that, only with buffalo wings. My friend and I love them so much that we have been systematically trying out buffalo wings from all over the Bay Area. 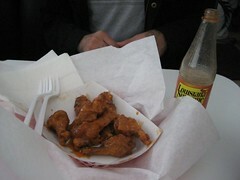 On Sunday, we went to 5 different places, ate their wings, and photographed and analyzed them. I honestly have no idea what this has to do with personal finance or entrepreneurship, but I want to show you some of the absurd things we discovered. 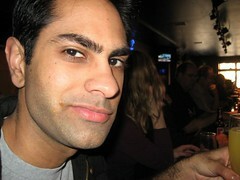 Oh yeah, and today’s Friday Entrepreneur is a buffalo-wing nut connoisseur. The funny thing was that everyone was watching the Super Bowl, and we were the only two people in there with our heads down who kept getting up and leaving in the middle of the game to go to the next place. I will continue updating you with my quest to find the perfect buffalo wing. Anyway, today’s Friday Entrepreneur is Aaron Foss, inventor of the WingDipper. I LOVE his unorthodox marketing strategies. 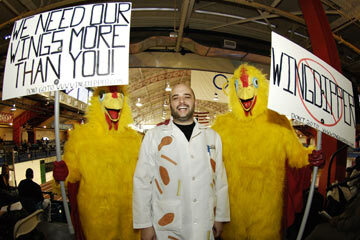 He hired chickens to protest his product! Who else would have done that? Being a small player calls for being different, not the same. He actually built a physical product, which is different than most of the other Friday Entrepreneurs I’ve featured. Check out how he did it (and his profit margins). This product hasn’t succeeded yet, but the idea alone challenges the “why would people need that–they could just use a bowl?” mindset. This product isn’t something you need, it’s something you want. Below, I ask Aaron about other industries where the products are “good enough” and then someone comes out with a product people really want. Finally, the reason I love this interview so much is that he took a weird/obscure passion and did something with it. How many people take what they really love and try to do something entrepreneurial with it? You’re one of the first Friday Entrepreneurs to have a real-life physical product. What is The WingDipper? It’s the perfect cup for dipping Buffalo wings. Have you ever tried to get dressing on your Buffalo wings? It’s impossible because they just don’t fit in a round cup. The WingDipper’s unique shape is designed to get dressing only on the part of the wing that you eat. There’s a round section for the drumette and a long section for dipping the flat. A picture is probably the best way to show how it works. See? You dip the drumstick in the middle of the cup, then the flat part of the wing lengthwise. Are you a huge weirdo? Well, I guess I’ve always moved to the beat of my own drummer. Maybe it’s because I’m an only child. I’ve never really let other people stop me. I find that when you get to the outer edges, you find people with genuine passion for whatever they do. I think that’s where I am. Once you realized this massive hole in the market, what did you do? Q: Why can’t you get dressing on the wing? A: The cup is a bad design – round is the wrong shape. A: You need 2 shapes to dip the different parts of the chicken wing. Q: But 2 cups? That’s silly. A: Right, so here’s where they intersect. Boom. The WingDipper design popped into my head and I could, literally, picture it on the bar. Like Doc Brown in Back to the Future, I guess. That same day I registered WingDipper.com and sent over a draft of my idea to my childhood friend and business partner, Mark. We’re kind of like sounding boards for all of our ideas. I think this is really important in business and in life. You need somebody who isn’t afraid to tell you that your ideas stink. Surprisingly, he was totally into the idea. He said it seems like one of those things that if it hit, might be big. I filed the papers for the patent but I didn’t really have a plan after that. I think a lot of people imagine they could build something like this, but how did you get attention for your product? A few days later, I saw a blog posting talking about a new show called ’American Inventor.’ I figured it might help get some free publicity for the WingDipper. I looked at the coverage of the other auditions and noticed that no one was doing anything different or fun. You saw a whole bunch of people waiting patiently in line. It seems that everyone forgot that they had to make good TV. So, I called Mark and we started to brainstorm some ideas. I came up with the following idea: I would play a Matthew Lesko-esque character being followed around by protesting chickens. The idea was that the chickens knew if the WingDipper was chosen for the show, people would be eating chicken like there was no tomorrow. Both Mark and his sister Lindsay agreed to dress up. I went and got two chicken costumes and started to decorate a lab coat with pictures of chicken wings, carrots and celery. As I’m ironing them on, I’m really starting to question my own sanity. Thinking about it now, any really good marketing campaign is a mix of uncertainty, bravery and stupidity. If you’re not nervous it won’t work, you’re probably not taking enough risk. The New York audition went great and a few weeks later I got a call that I had made it to the semi-finals in LA. My first reaction was, “What about my chickens?” They said, “Yeah! Bring the chickens!” So off we went to LA. The four judges were really supportive. Ultimately, they said it wasn’t right for the show (they were looking for something that could be sold at Target or Wal-Mart) but that I should make some contacts and do it on my own. That seemed like a good advice. When I got back from LA, I did some research and decided to exhibit at the National Restaurant Show in Chicago in May. This is the major tradeshow in the foodservice industry. I figured I had about 8-10 weeks to get everything ready. How tough could it be to get some prototypes made? Now, you have to realize that I knew nothing about plastic manufacturing. Nothing about the restaurant industry. This was all new to me. I wanted 5,000 cups, at most. Most manufacturers didn’t want to talk to you unless you wanted 5,000,000 cups made. After Googling a few places I found a company in California that would do a small initial run. And stand out it did. At the show, the booth was mobbed. 4 days of non-stop excitement. All the restaurants that we spoke to wanted to buy it as soon as possible. Everything was going great and I figured it would be smooth sailing from here out. What were the roadblocks you faced? 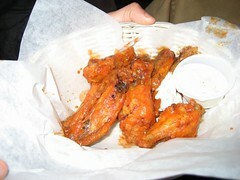 Roadblock 1- At the show, I learned that take-out wings are a big part of the industry. In order to do this, they need lids. 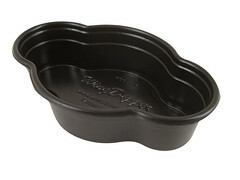 I found out that the company that made the prototypes didn’t have the expertise to engineer a lid and the volume I needed was too much for them to handle. well as a reusable version. Roadblock 2 – I still have a day job. I still have day-to-day clients that have projects to complete. Making time for 2 full time businesses gets challenging sometimes. This on top of having some sort of personal life is a very delicate balance that I don’t always succeed at. What happens now? What’s your marketing strategy? The official launch is March 4, 2007 at the New York Restaurant Show in New York City. Then it’s off to Chicago again in May. In the meantime, I’ve been getting WingDippers into as many hands as possible. To steal a line from Seth Godin, I’m trying to unleash this ideavirus in the wild. I looked at the Chicago show as though it was the introduction of the product. I should have looked at it more as market research. I was telling people that they would be available by the end of the summer. I was making promises based on guesses. In reality, it took 6 more months until I was able to get them out the door. I think that made me look more like a crazy inventor and less like a real business. I should have told them that I would let them know when I went into full production. I wouldn’t have talked to them again before I was able to deliver product. What is your favorite type of wings? Why? I go old school – The Anchor Bar wings in Buffalo. They invented the Buffalo wing so I have to give them respect. If you’re ever up in that area, stop in – it’s well worth it. They sell their sauce in bottles too and it’s just about as good. What was the biggest surprise in doing this? I thought it was going to be easy. I figured that everyone would see the WingDipper and be throwing money at me. I really thought that the idea alone would be enough. What I realized is that even if you have a great idea – you need to spend a lot of time getting the word out. Also, I was amazed at how willing people were to share their knowledge with me. At the show, I didn’t hide the fact that I was new to the industry and that I didn’t have any experience. People with 20 or 30 years experience just shared a massive amount of knowledge with me. From your experience, can you tell us 3 myths of creating a physical product? You can. There are lots of places that will work with you to design, manufacture and distribute your product. With outsourcing, it’s pretty easy to run a business from your desk. 2 – It’s easier to sell a physical product than attract people to your site. The grass is always greener on the other side. It’s just as tough to get people to buy your product as it is to get them to come to your site. We’re talking about a small piece of plastic that sells for pennies. I have to keep costs down and compute margins on tenths of a cent. For me, this is a game of inches. Why build the Wing Dipper? Aren’t bowls good enough? I guess this comes from my programming/design background. When I program, I make sure I do it right the first time. If I don’t do it right, I’ll pay for it later. Good design is valuable in more ways than you can see initially. That being said, it’s equally important to look at the business side of things. Buffalo wings have this fanatical following. Bars and restaurants pride themselves on their wings. Entire chains have been formed that serve only wings. People have wing nights with their friends. Putting this product together with those kinds of these people was the real important part. If I designed a cup for dipping asparagus, I don’t think it ever would have gotten out of the initial idea stage. Can you think of other product examples where everyone says the state of the art was “good enough” and then something better came along? The best example I can think of is Aeron Chairs from Herman Miller. Before these came out, people thought a chair was a chair. If you’re an executive, you spend a lot of time in your chair. You need to be comfortable. You become fanatical about your comfort and productivity. So, yes, a kitchen chair is good enough to sit in. But there is a segment of the population that will pay a premium for the best. Same thing with Starbucks. They turned a .50 cent commodity into a $4.00 premium beverage. As you have said before, it’s all about executing on ideas. It’s not about waiting for the big idea. It doesn’t have to be earth shattering to have an impact. Do people think you’re nuts for your wing obsession? I’ve found that people respect other people that have passion for what they do and are confident in their ideas. When I tell people about the WingDipper, I see that skeptical look on their face. But then they see how it works – they try it out – and I can tell when they ‘get it.’ That’s when I feel really good. Can my readers get a sample of The WingDipper? Here’s a special offer for your readers. Go to http://www.wingdipper.com/purchasefnf.php and you can get a special Party Pack. It’s 12 disposable and 2 reusable WingDippers for $12. That includes shipping. And, if you haven’t signed up for Google checkout yet, they’ll give you a $10 off coupon so it’ll cost you $2 bucks to try it out. Now what? Check out the WingDipper web site. Read other Friday Entrepreneurs and sign up for my newsletter. Oh man! After reading this I am having some serious cravings for some wings! I spent the last summer in Buffalo and became addicted, but now back in Montana there are no good wings to be found! This article was a great read and really interesting. When I first started reading this, I thought “this sounds stupid.” But by the end of the interview, I thought the guy was really creative and passionate, as well as down to earth. It’s really nice to read about someone who comes up with a crazy product idea… and actually does something about it. Good luck to you, Aaron. 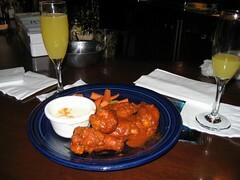 I hope to see the WingDipper in restaurants across the country in the near future. Wow…I really DO want one. I think I will be off to order a pack soon. I started reading this thinking it had to be the dumbest idea ever, but once the guy explained how and why I was instantly sold. Its great to see someone who is passionate about what they do, that is surely something the business world needs everyday. I just had wings the night before last and was lamenting the round dressing cup they gave me. Way to fill a niche Aaron. Good marketing ideas too. This is my favorite FE in the month or two I’ve been reading your blog. Aaron gave you a lot of interesting info that I haven’t seen before. I’ll probably stop there for some tasty wings after the Sabres game tonight. The success will come down to price unfortunately. Restaurant margins are tight so pennies make a difference. He should pitch to the higher end places while he builds the much needed volume. They are still price sensitive but less so. Long time reader…first time poster. 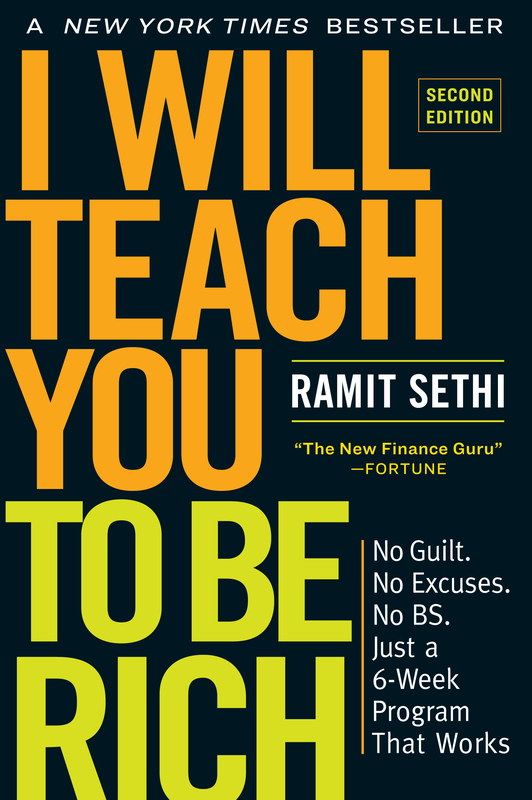 Ramit, I’m wondering if you could do an analysis of the Friday Entrepreneurs pre & post you publishing their accomplishments on your site? I know that I clicked on the Entrepreneurs’ website many times when I read these articles. I never bought anything (although I’m thinking about these Wingdippers), but I was curious to see how the exposure on this side helped or hindered (god forbid) the Entrepreneurs. I would equate this to Oprah and her book club…ok maybe not exactly, but close! Try University Chicken AKA Cluck U in santa clara by santa clara university. get the atomic level for best taste, or global thermo nuclear if you want to impress someone with your heat tolerance. or if you really like pain, do the 911 challenge. DP: I’ve done that (check out some results of being featured on Friday Entrepreneurs here). Nathan: I’ve had those. They’re definitely hot, but not very good. To me, it’s a cheap trick when some place just tries to pour in spices just to seem hot without actually tasting good. Hot for the sake of being hot does not mean good!! Until recently, I think Old Pro’s habanero wings were the best, but then they switched to the smallest chicken wings I’ve ever seen in my life. Please let me know if you have more recommendations! this was great. I knew Aaron in college. we had classes together. I think we even had a few projects together too. Not only was this not creative, it was the exact opposite of creative – it was a ripoff. This sounds a whole lot like Chik-fil-A’s protesting cows who want everyone to stop eating beef and eat more chicken. Wouldn’t it suffice to appear creative to the masses? Seems to me like the important part is the **semblence** of out-of-the-box thinking, regardless of whether that’s really the case. How many people ate wings last night for dinner due to this blog? I know I did. I had Cluck-U in the Baltimore area. I also noted how the dressing was packaged with my togo Cluck-U order. They used pre-packaged blue cheese single serving cups from a dressing manufacture. I wonder if you have approached any of the dressing makers to use your cup design for a prepackaged sealed type of setup? It seems like I had the same hesitations as many others when I sat down to read this piece. I was convinced that you had gone off the deep end. I remember several discouraging comments about your last post being “soft” and I thought this was going to add to those nay-sayers, but you really had something here. This piece is definitely now one of my favorite IWTYTBR pieces so far and most definitely the best Friday Entrepreneurs! Keep up the good work and I’ll keep wasting my productivity at work on reading your site. The guy seems to be passionate about what he is doing and thats great! Goodluck and thanks for sharing. Great Idea..so simple its brilliant! Can he get these in production in time for March Madness??? It’s a ways away from the Bay area, but somewhere that you have to try is the Anchor bar in Buffalo, NY. The original home of buffalo wings, and in my opinion, by far the best. out-eat anyone in a spicy eating contest? vaman, are you reading this? 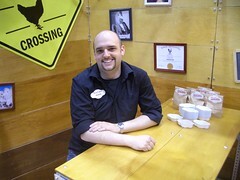 Just a quick note to let everyone know that the WingDipper was named ‘Best New Product’ at the 2007 NY Restaurant Show. Thanks to everyone for the support and encouragement over the past few weeks!